Our family enjoys visiting the beaches at the Jersey Shore, especially the beaches in the Ocean City, Wildwood and Cape May areas. You'll find these three particular Jersey Shore destinations to be family-friendly and jam-packed with fun activities for you to enjoy. We spend a lot of time in Wildwood, New Jersey due to their beach scene. The beaches are wide and are 100% free to use. That's right, unlike a lot of the other beach destinations in the state, the beaches in Wildwood don't require any paid beach tags! Plus, the beaches are wide and they take great pride in keeping their beaches sparkling clean. Throughout the summer months they host a lot of different events right on the beach! You'll find the Jeep Invasion, Monster Trucks, Fireworks, Music Concerts, Movies on the Beach, GoKart Racing, Amusement Rides, Inflatable Balls, the yearly Marbles Championship, Waterpark Slides, Seafood Festivals, Antique Car Shows, Bike Week, Fireman's Week, and more! They always have something going on that you and your family can enjoy. If you're a dog lover, they now have an oceanfront dog park that sits right on the beach. It's a fenced in area where your best friend can run and play. There are tunnels, tires and a water station for fido to enjoy. The dog park is completely free for you and fido to visit. How fun is that? Totally fun! For those of you who love being in the water...you can go jet skiing, canoeing, kayaking, water skiing, surfing, paddle boarding, swimming, fishing, boating, parasailing, etc. Not fond of being in the water? Don't worry, you'll find miles of beaches that you can sit on and just relax for the day. We love visiting the beaches in Wildwood, New Jersey and visit several times ever year. In our honest opinion, the best time to visit in in late June and during mid-September. When we visit in June, the entire family goes since school is out for summer. When we go in mid-September, just the adults go for a weekend getaway. July and August is extremely crowded and the hotel and motel rates are their highest. 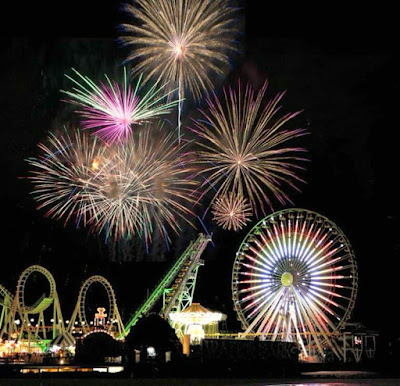 You can find all kinds of activities to enjoy, places to stay, delicious restaurants to eat at and all kinds of other Wildwood and Jersey Shore recommendations right here on our blog in the New Jersey section and on our New Jersey board on Pinterest.